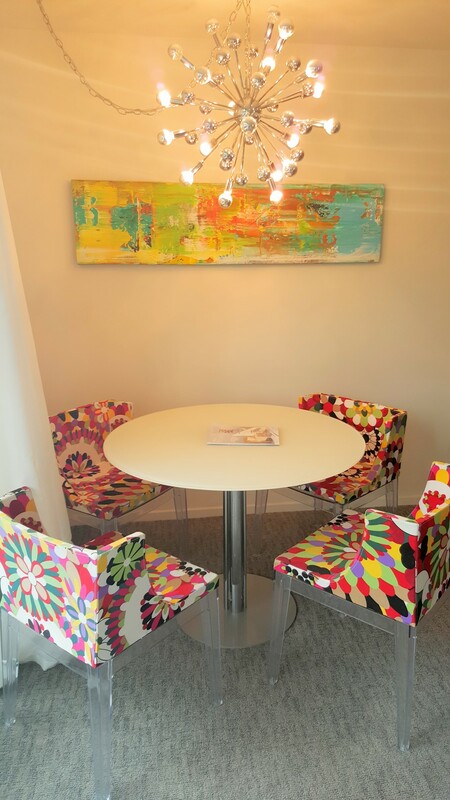 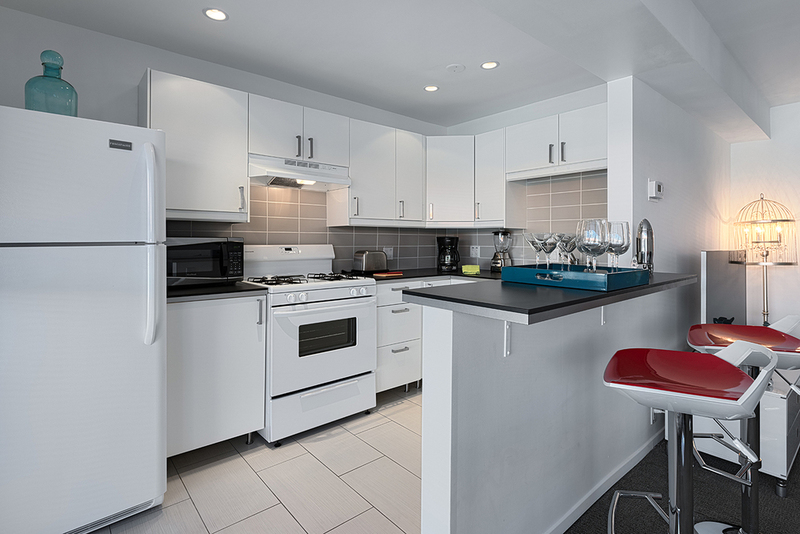 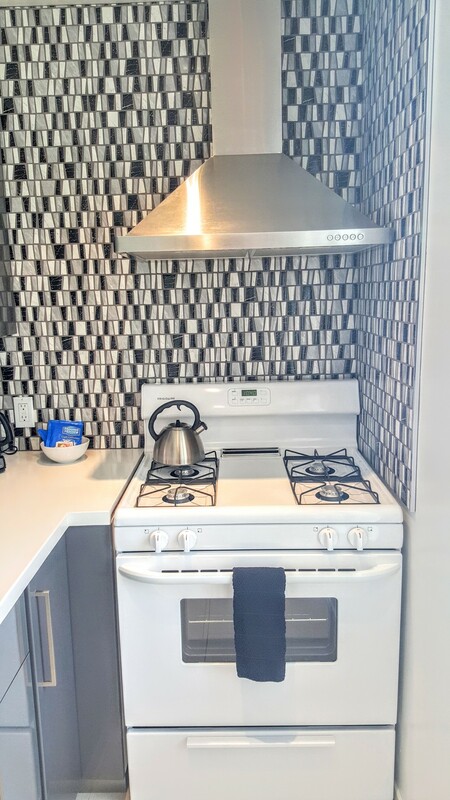 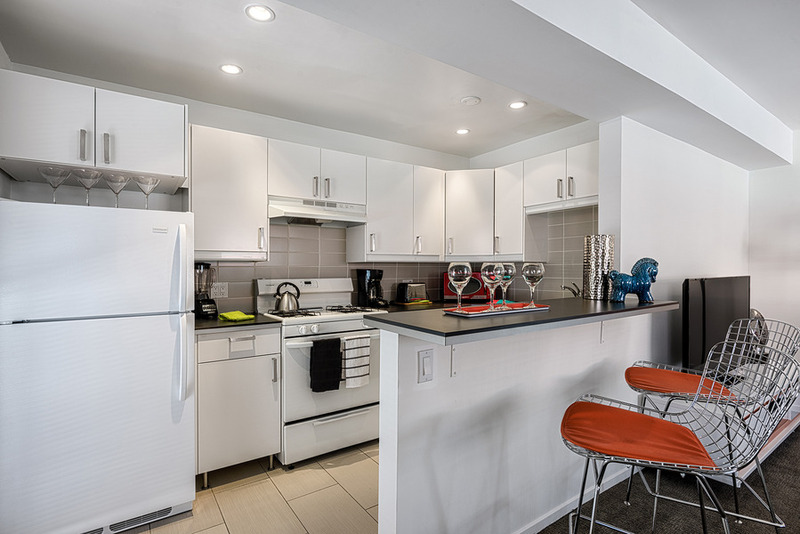 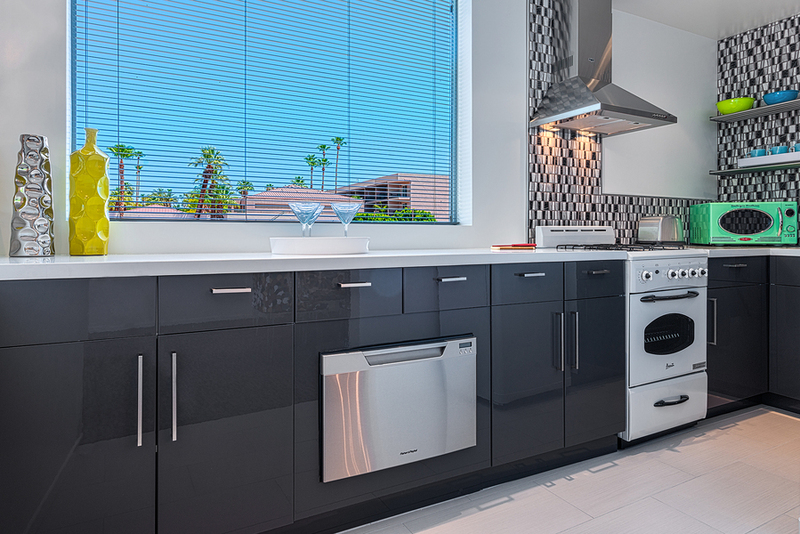 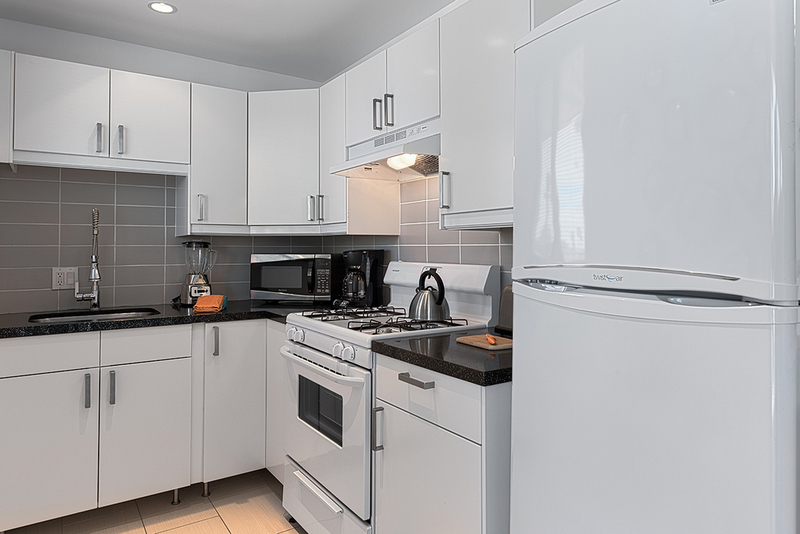 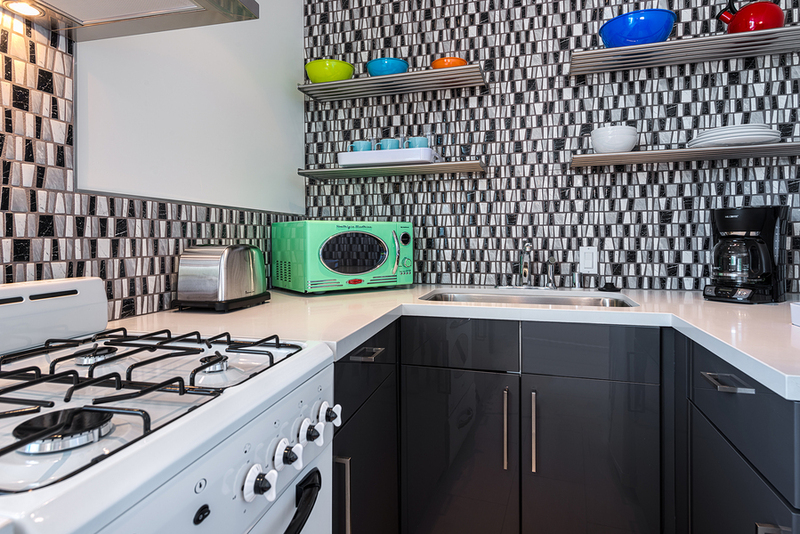 Ranging from studios to a 2-bedroom, each apartment features fully equipped kitchens, spacious floor-plans, over-sized private patios or balconies, modern appliances and luxury furnishings. 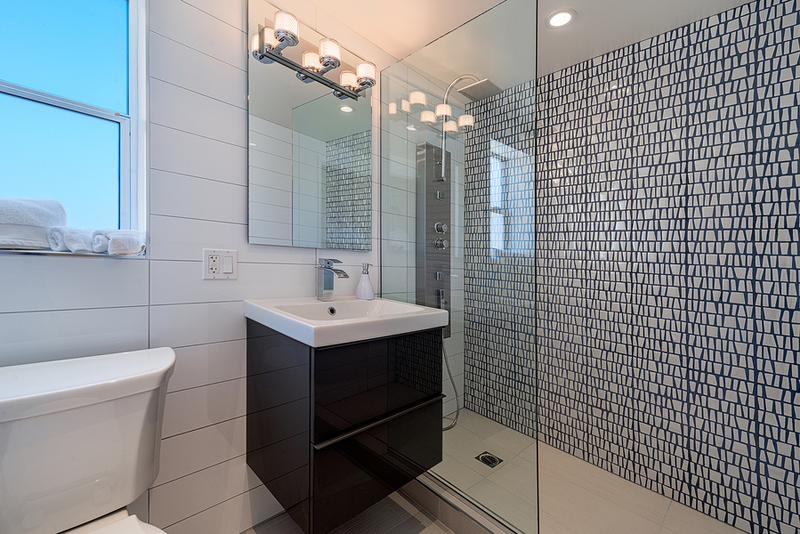 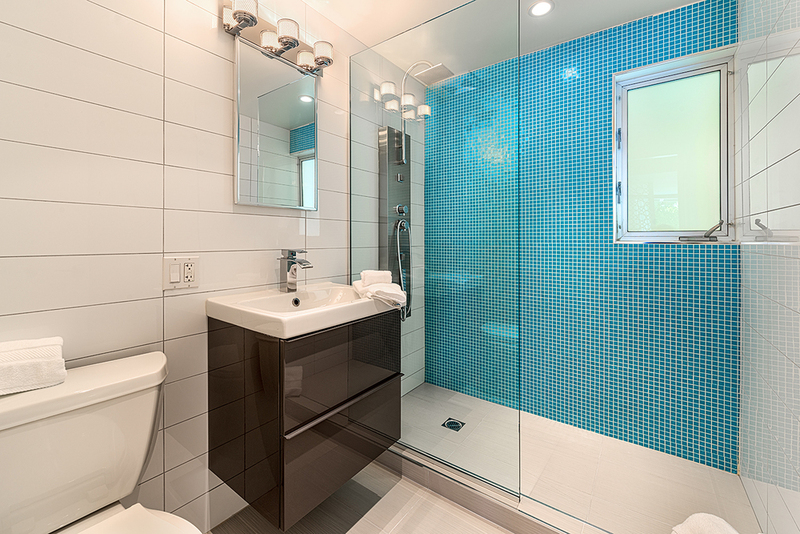 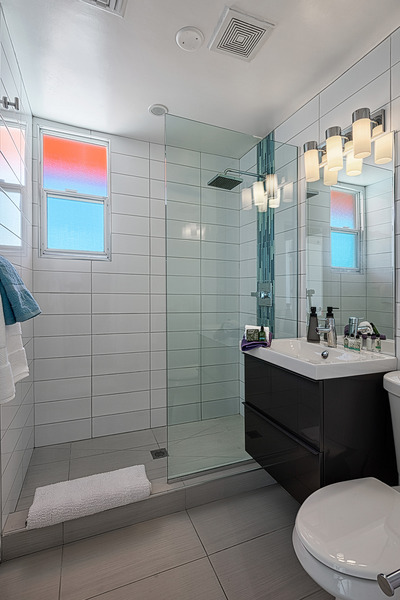 All bathrooms feature walk-in showers, a set of lush towels for each guest, body and hair care products, and a hair dryer. 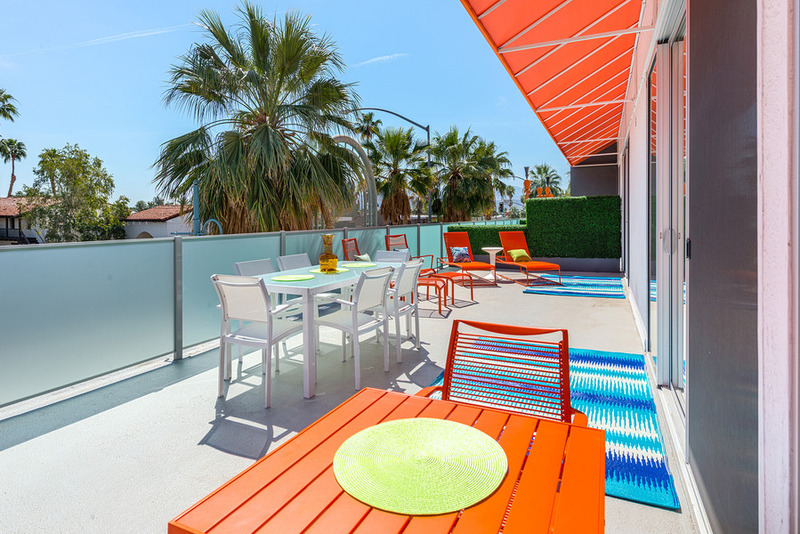 Other amenities included in each unit are free Wifi, pool towels for each guest, generous closet space, hangers and one luggage rack. 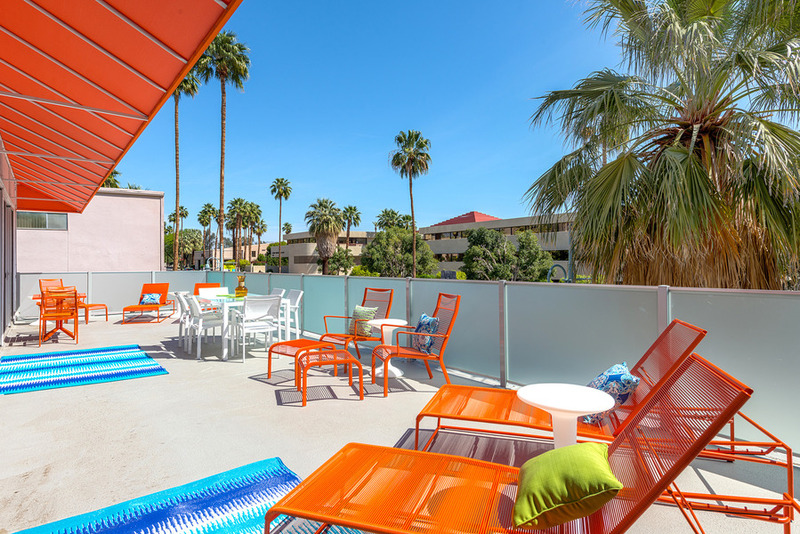 Studios: Four studios sit on the ground floor of the West end with an over-sized, sunny patio featuring a gas powered fire-pit, and three studios sit on the top floor with private balconies, all within steps from the central pool, Jacuzzi and grill. 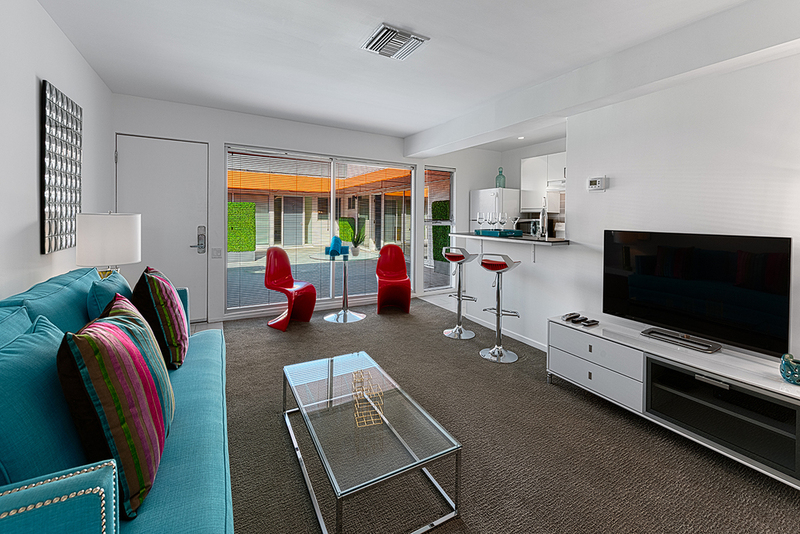 The apartment is equipped with a King bed, luxurious couch, dining/working table, and cable TV with a DVD player. 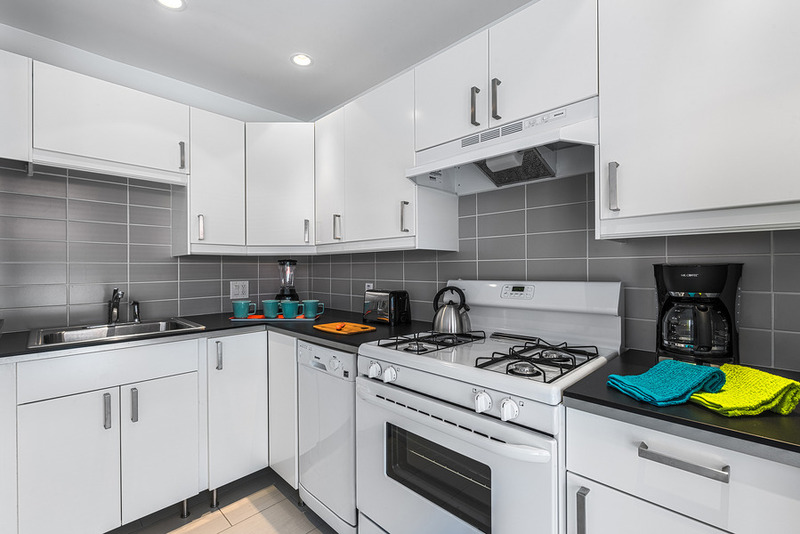 West End 1BR with Patio #107: This apartment sits on the ground floor of the West end with an large, sunny patio featuring a gas powered fire-pit, within steps from the central pool, Jacuzzi and grill. 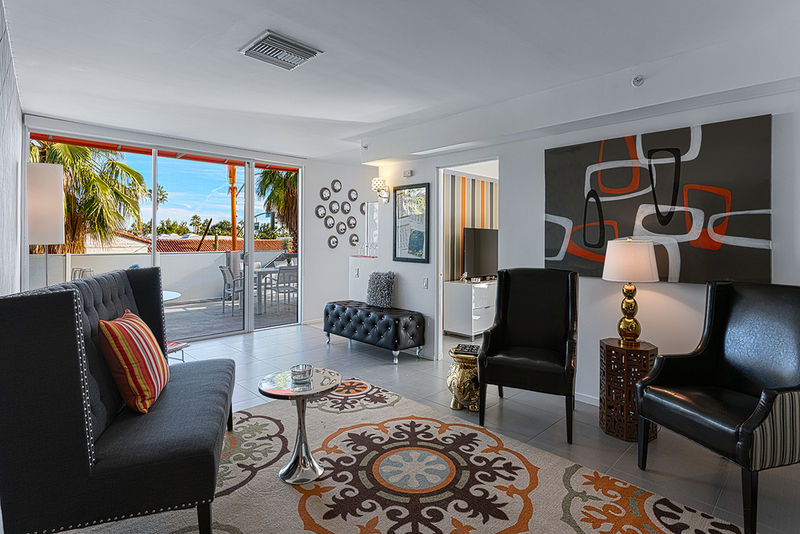 The living room offers access to a private patio, a pull out couch for two additional guests and cable TV. 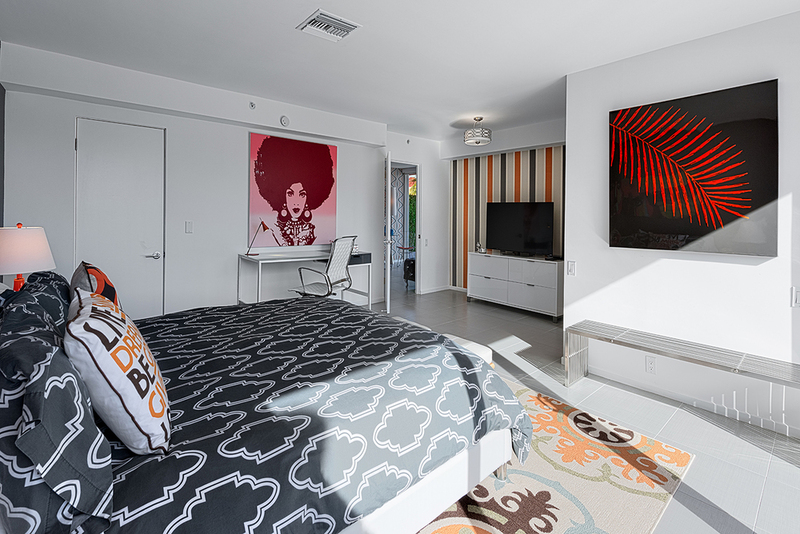 The bedroom is equipped with a Queen bed, comfortable linens, BluRay player for watching DVDs on the flat screen and a second access to the patio. 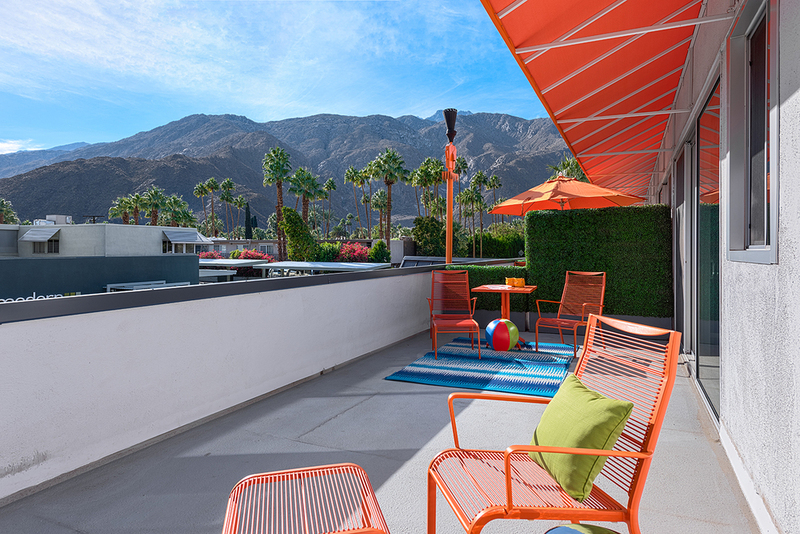 West End 1BR with Balcony #207: This apartment sits on the Northwest corner with two balconies and stunning views of the Mountains, within steps from the central pool, Jacuzzi and grill. 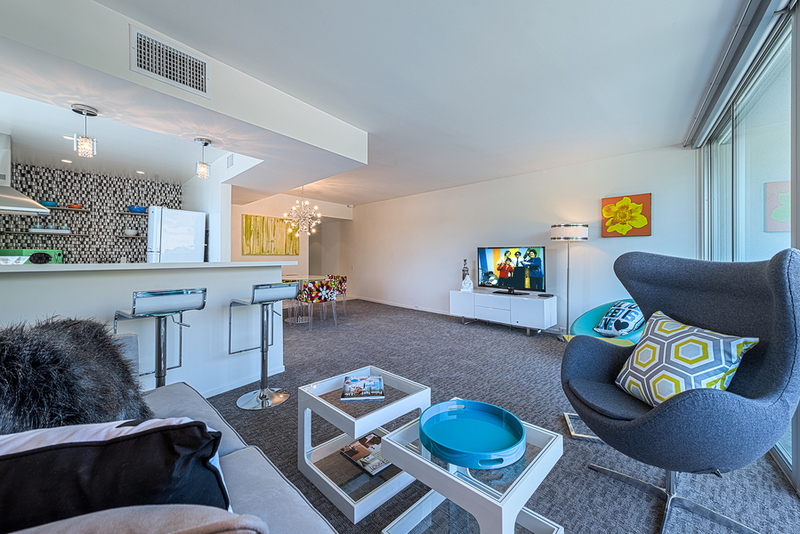 The living room offers access to a private balcony, a pull out couch for two additional guests and cable TV. 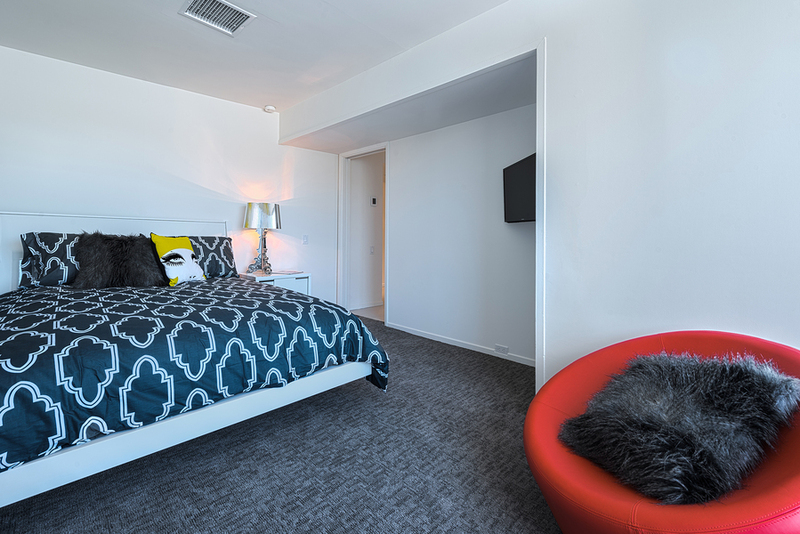 The bedroom is equipped with a Queen bed, comfortable linens, BluRay player for watching DVDs on the flat screen and a second access to a smaller balcony. 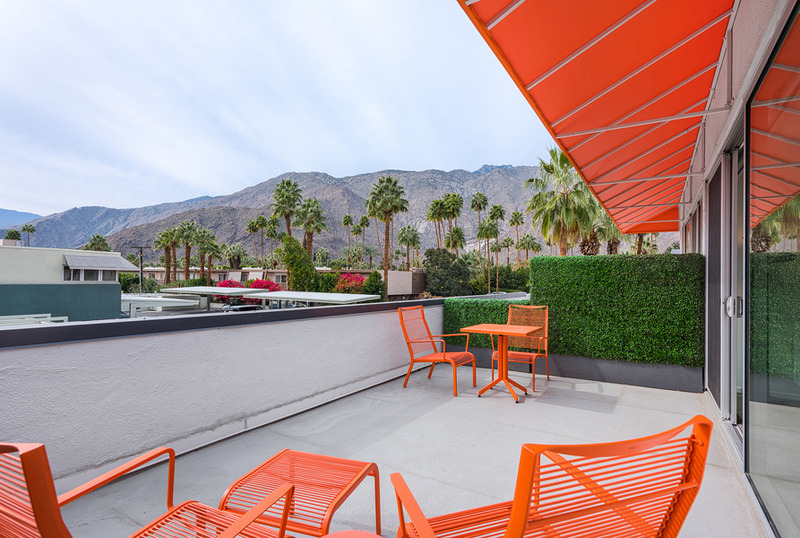 West End 1BR with Balcony #203: This apartment sits on the Southwest corner providing stunning views of the Mountains from two balconies within steps from the central pool, Jacuzzi and grill. 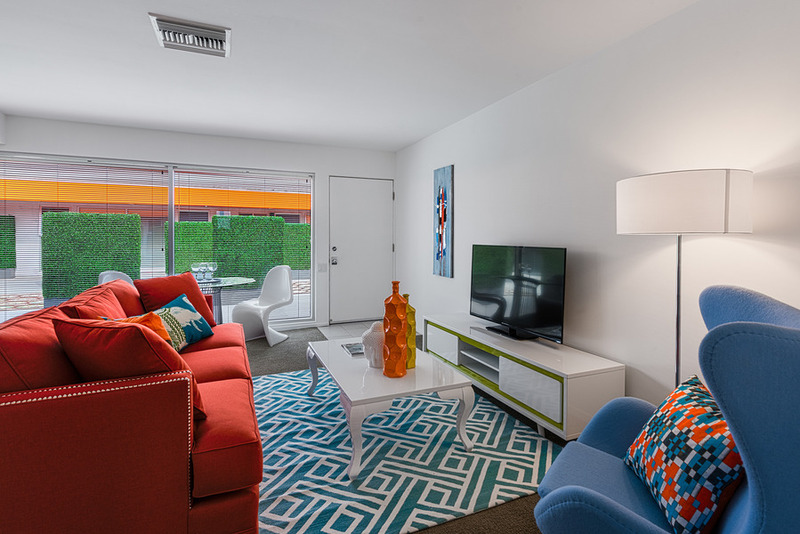 The living room offers access to a private balcony, a pull out couch for two additional guests and cable TV. 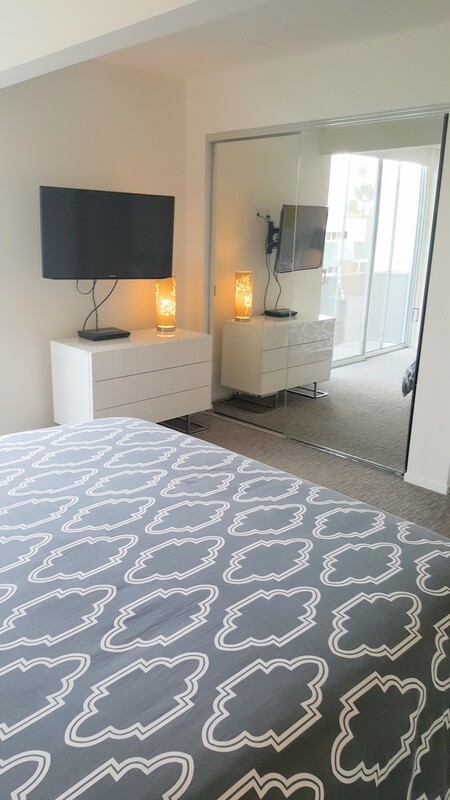 The bedroom is equipped with a King bed, comfortable linens, BluRay player for watching DVDs on the flat screen and a second access to a smaller balcony also with views of the Mountains. 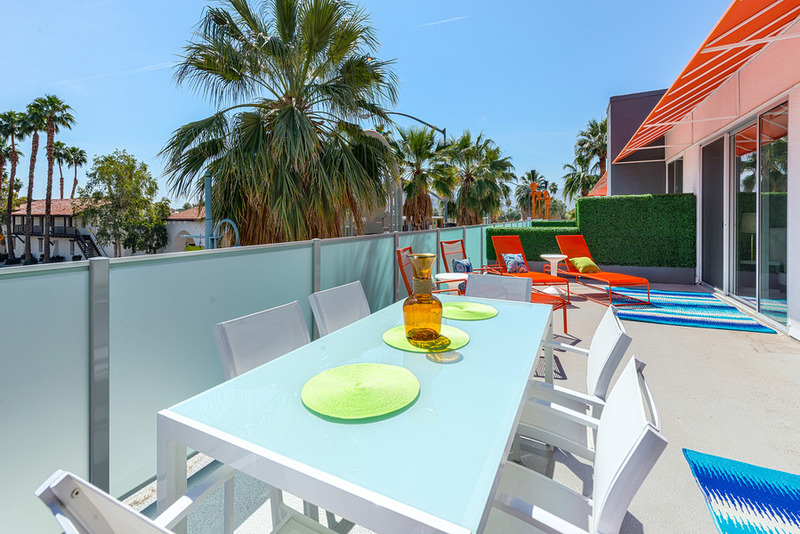 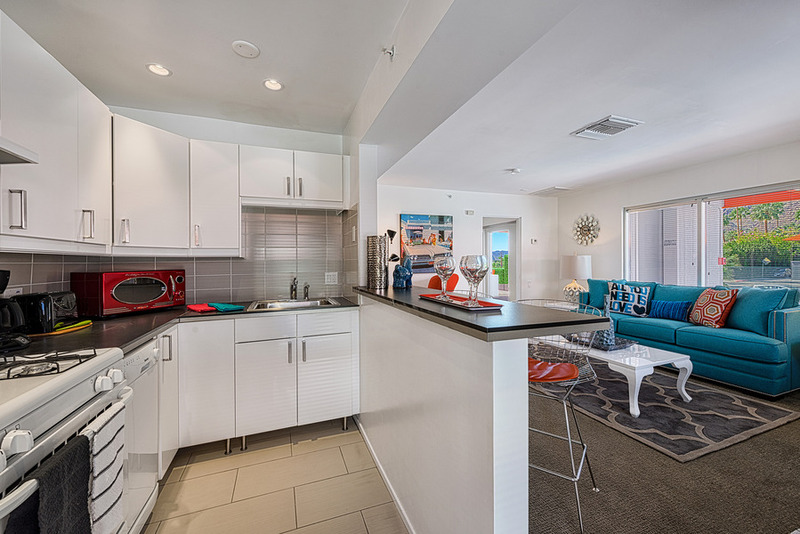 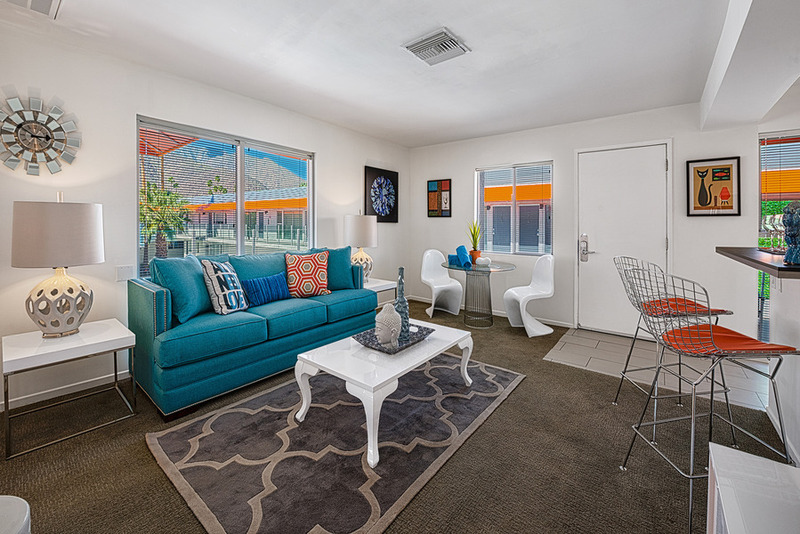 The 2BR/2BA is located on the East end of the building overlooking Palm Canyon Dr. with an oversized private deck decorated with the building's iconic Tiki torches, modern furniture and hedges. 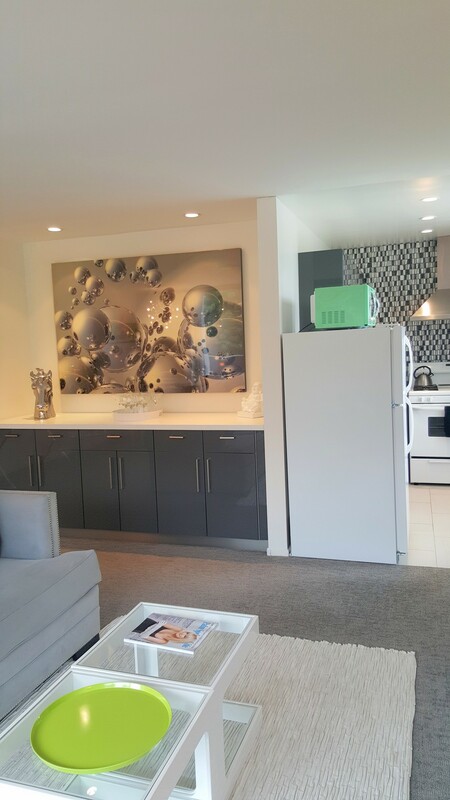 This unit has King beds, a full kitchen, three access points to the balcony from each bedroom and the living room, flat screen TV with cable in the living room and Blu Ray in each bedroom. 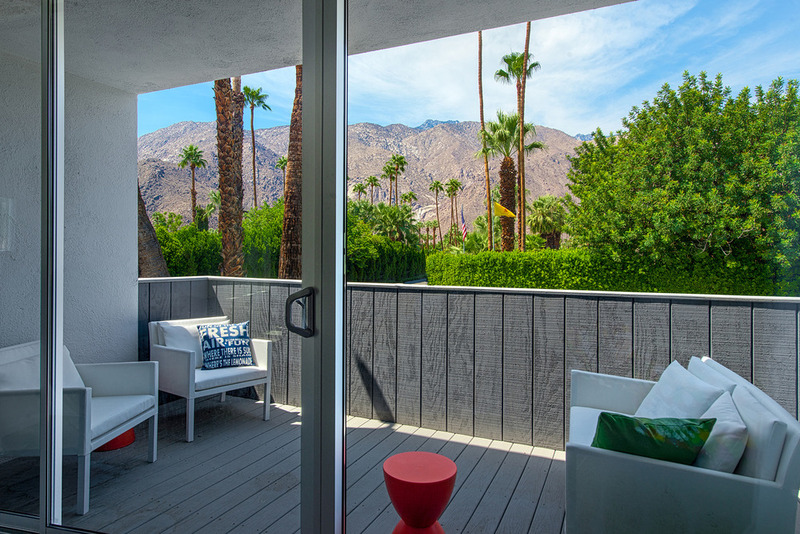 Master Suite, #219: Situated on the Southwest corner of the building, this is our most sought after accommodation for couples and events with it's over-sized wrap-around deck with extraordinary Mountain views, and accented with the building's historic gas-powered Tiki torches overlooking Palm Canyon Dr and Via Lola. 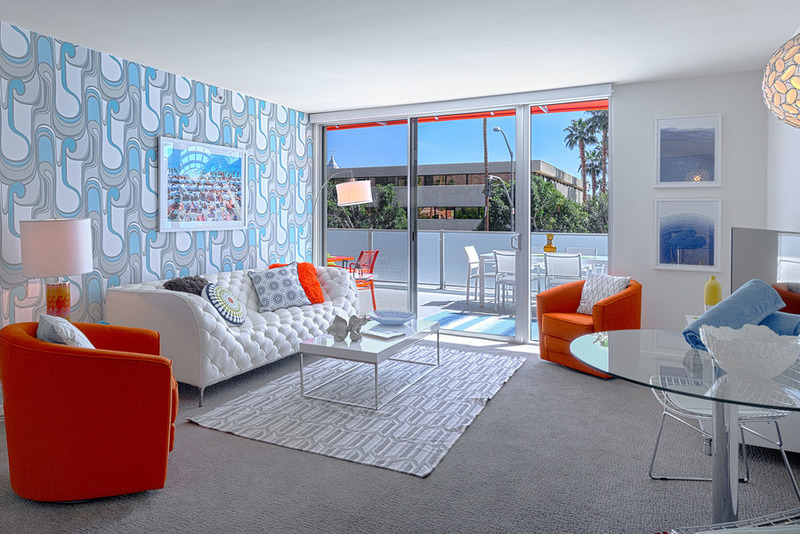 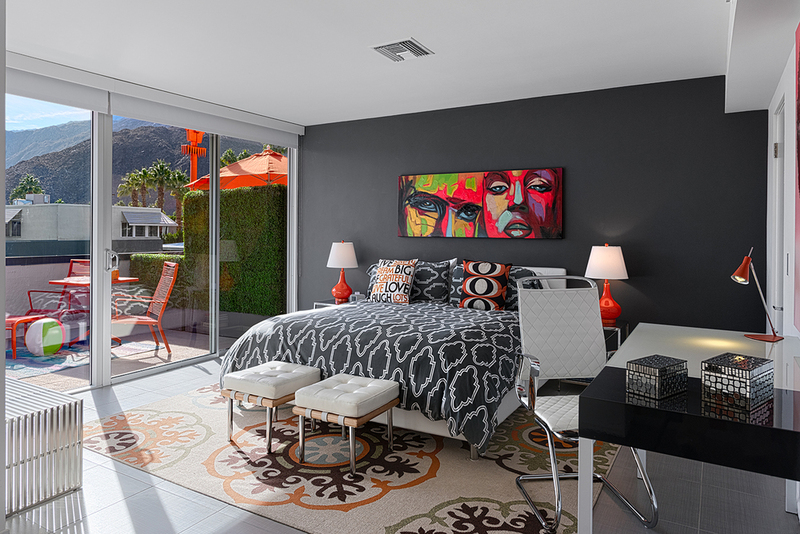 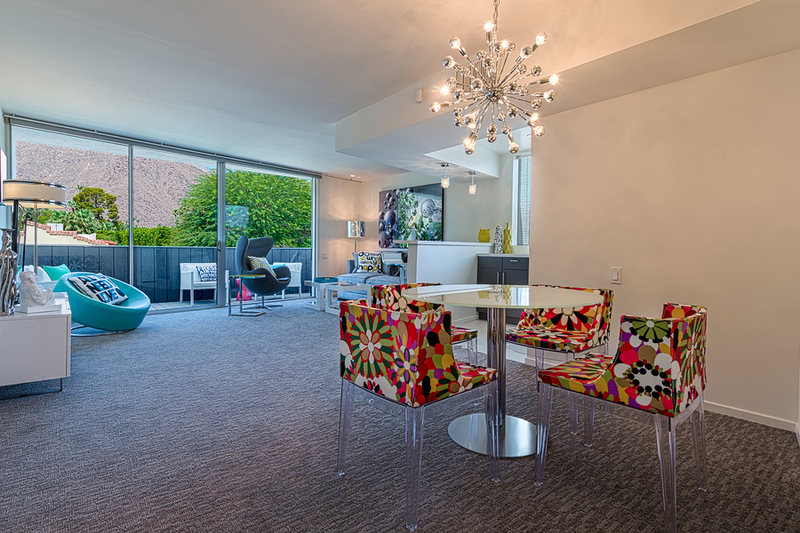 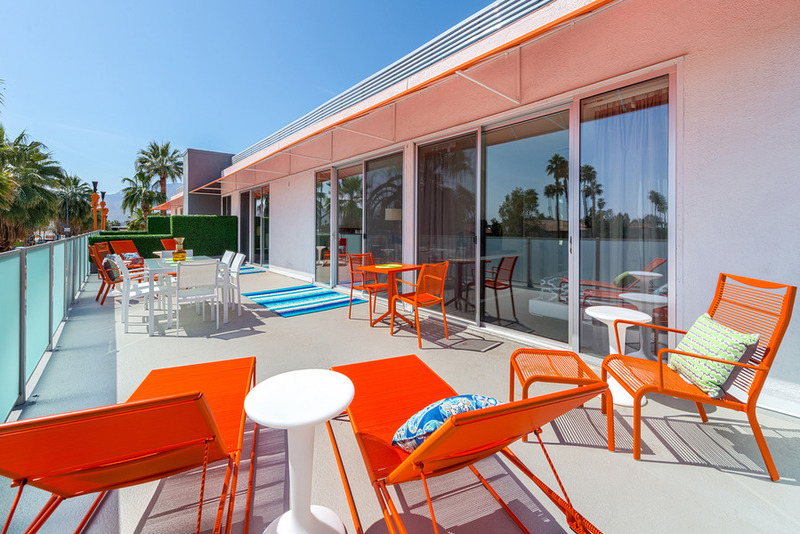 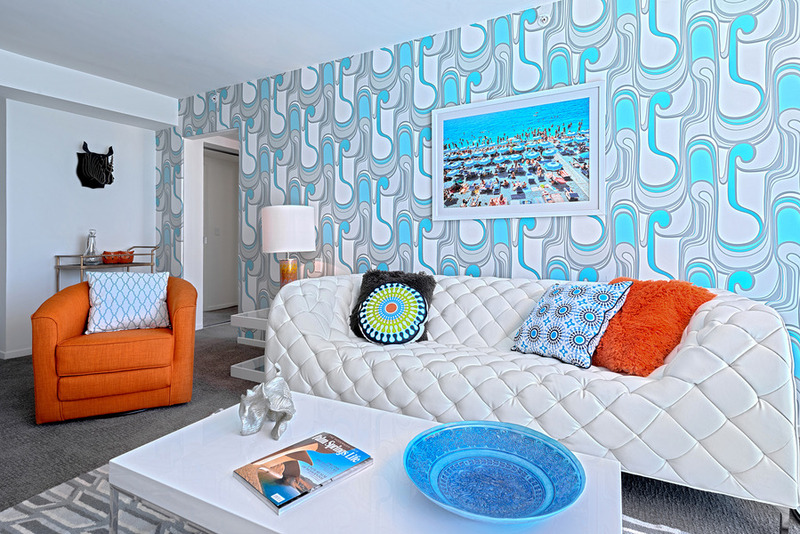 Everything from the master bedroom to the living room and kitchen are carefully accented with old Palm Springs retro designs. 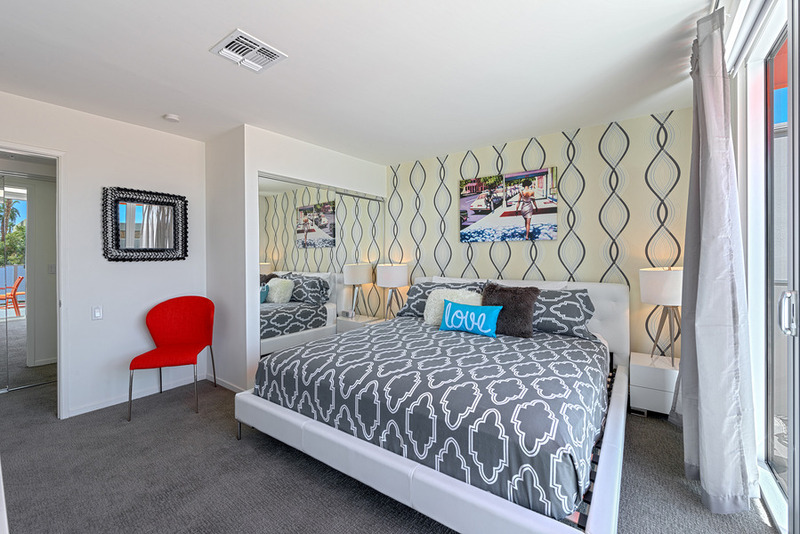 The bedroom features a second access to the deck, and is equipped with a King size bed, TV for watching DVDs, working desk and a generous amount of closet space. 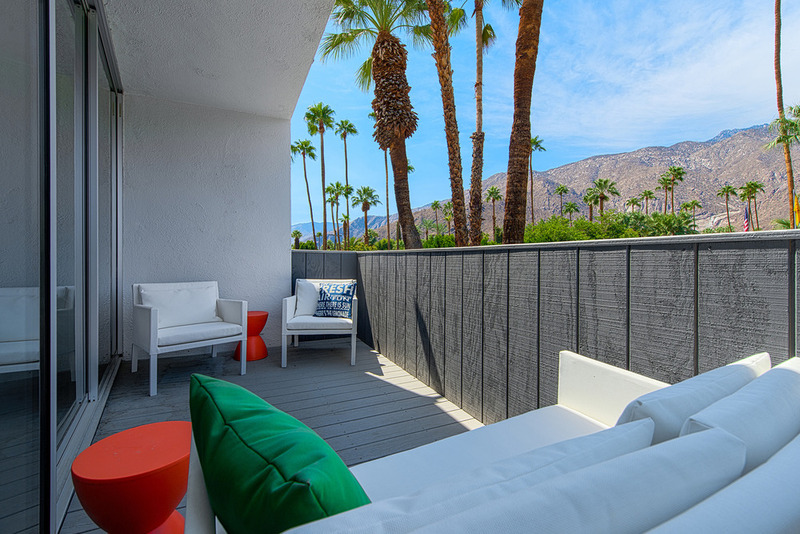 1BR, Balcony #222: This apartment provides views of the Mountains from the living room and an over-sized, private balcony off the bedroom overlooking Via Lola, within steps from the central pool, Jacuzzi and grill. 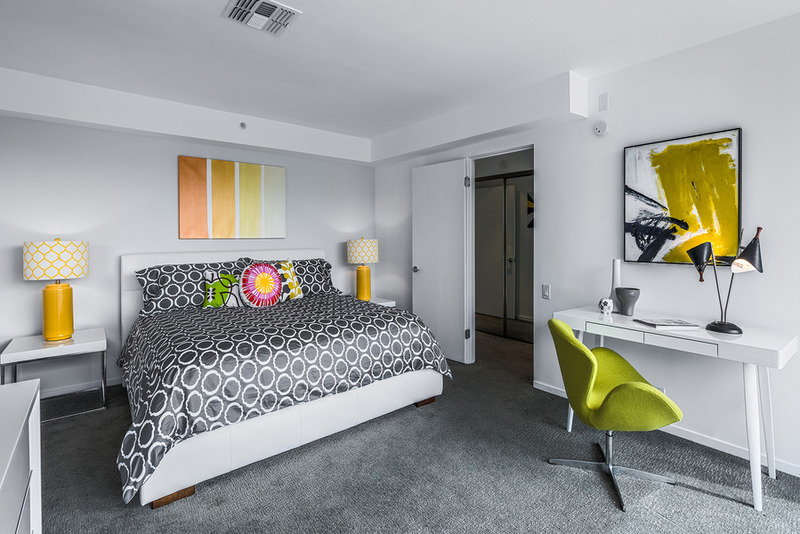 The bedroom is tucked away on the South end of the building and equipped with a King bed, comfortable linens, a working space and a BluRay player for watching DVDs on the flat screen TV. 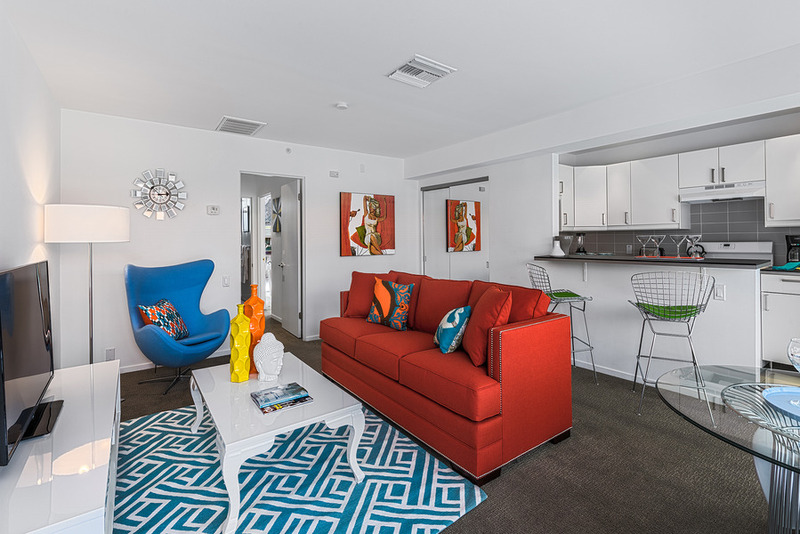 The living room offers a comfortable setting with a pull out couch for two additional guests and cable TV. 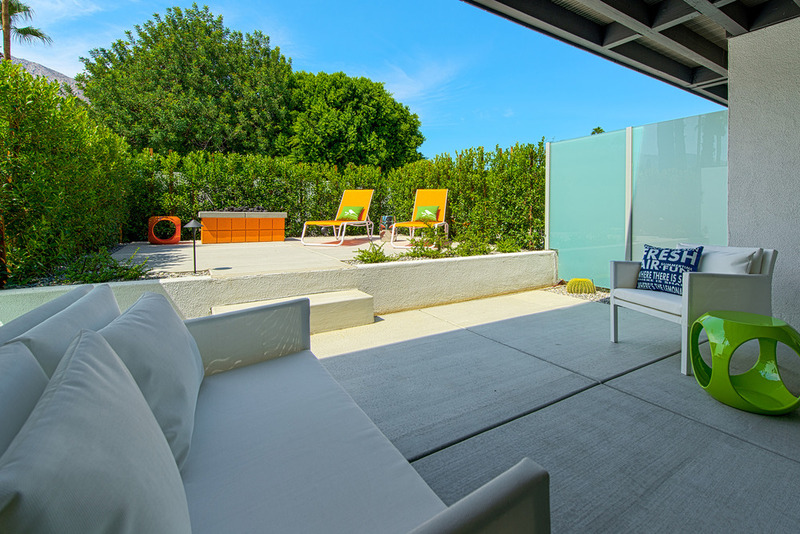 Views of the top floor courtyard are visible from the living room and kitchen. 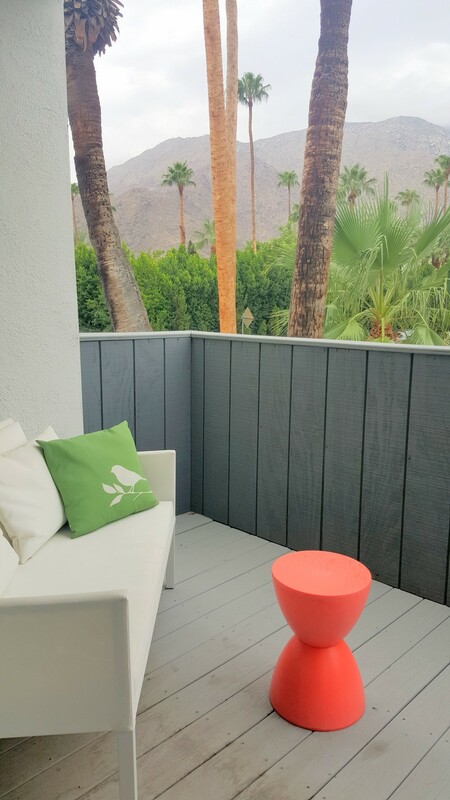 1BR, Balcony #221: This apartment is bright and cozy, and provides views of the Mountains from an over-sized, private balcony off the bedroom overlooking Via Lola, within steps from the central pool, Jacuzzi and grill. 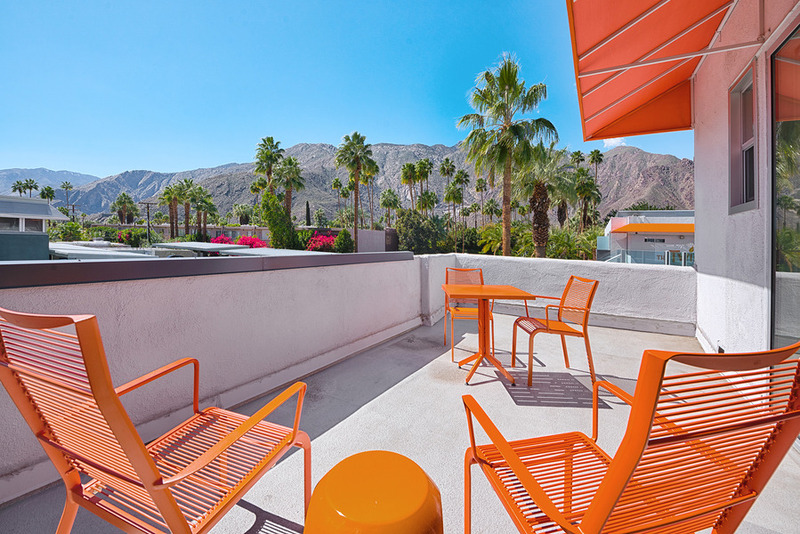 1BR, Balcony #220: This apartment is bright and cozy, and provides views of the Mountains from an over-sized, private balcony overlooking Via Lola, within steps from the central pool, Jacuzzi and grill. 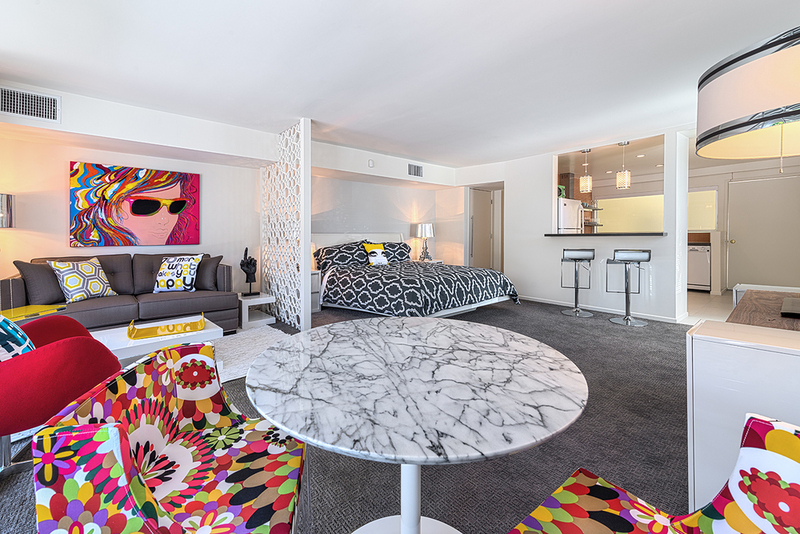 The bedroom is tucked away on the South end of the building and equipped with a King bed, comfortable linens, and access to the balcony. 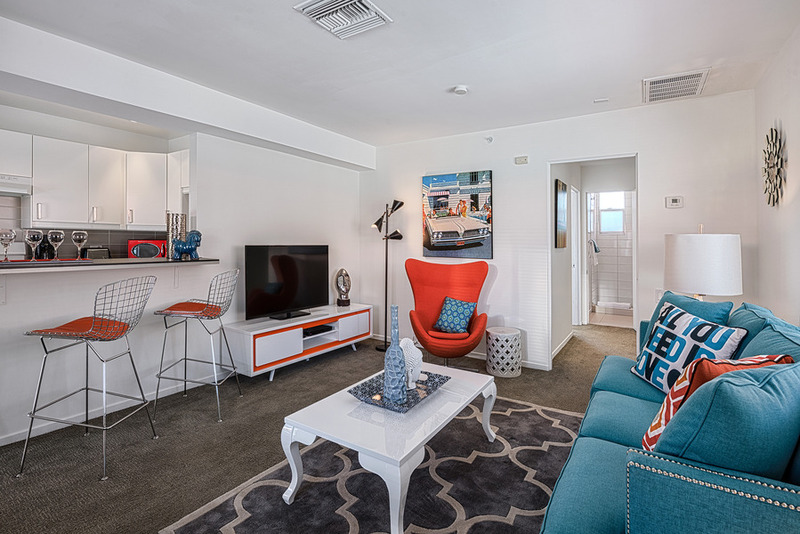 The living room offers a comfortable setting with a pull out couch for two additional guests and cable TV. 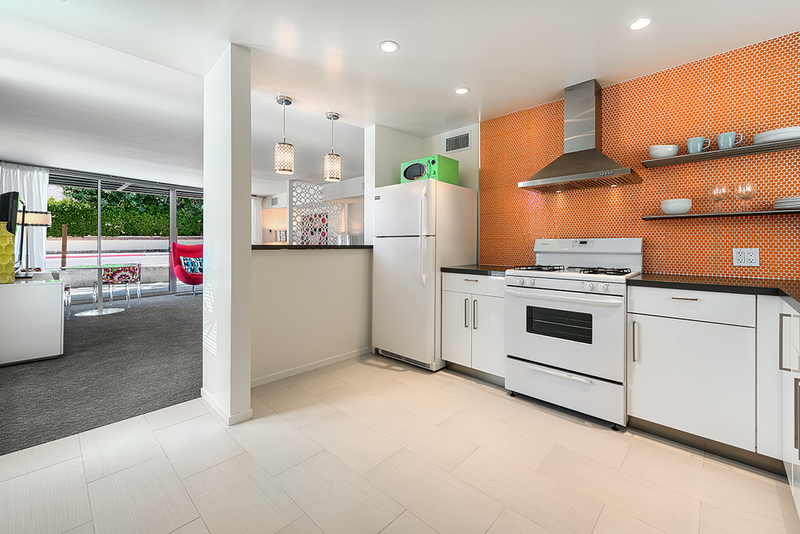 Views of the top floor courtyard are visible from the living room and kitchen. 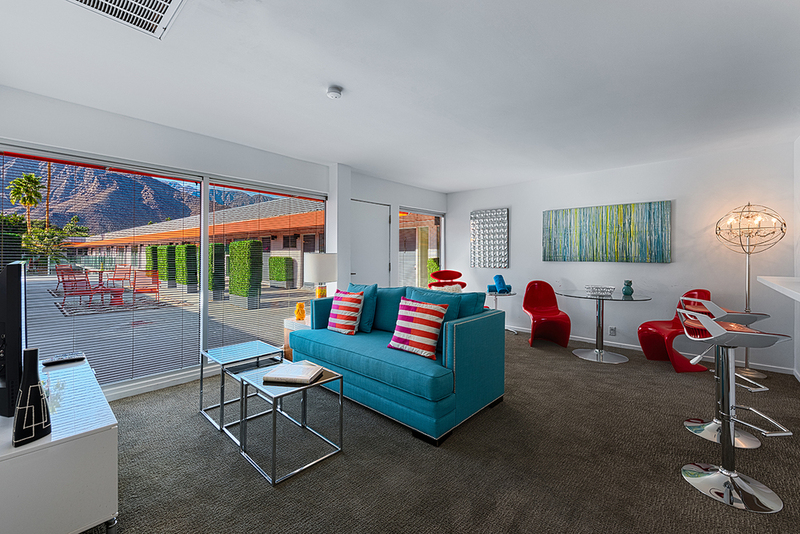 1BR, Balcony #218: This apartment is perfect for a group of four and has stunning Mountain views from the living room with a large balcony off the bedroom, within steps from the central pool, Jacuzzi and grill. 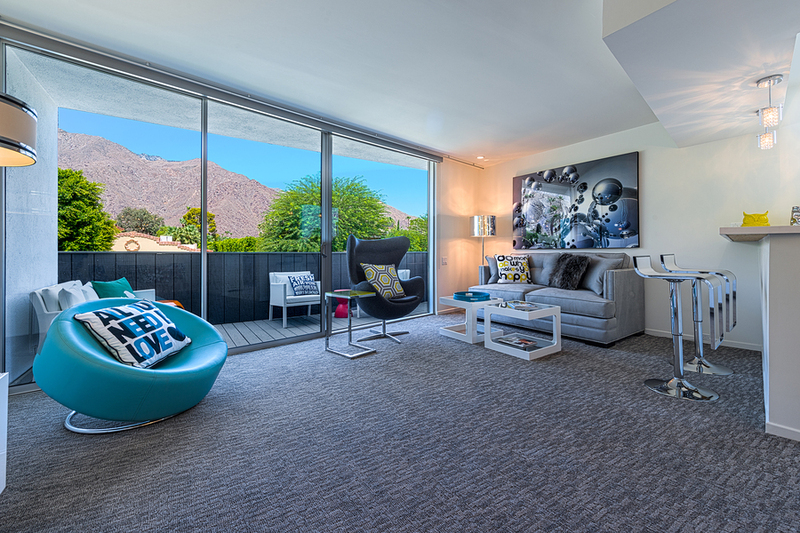 The living room windows light up the room and offer incredible views of the Mountains and of the top floor courtyard. 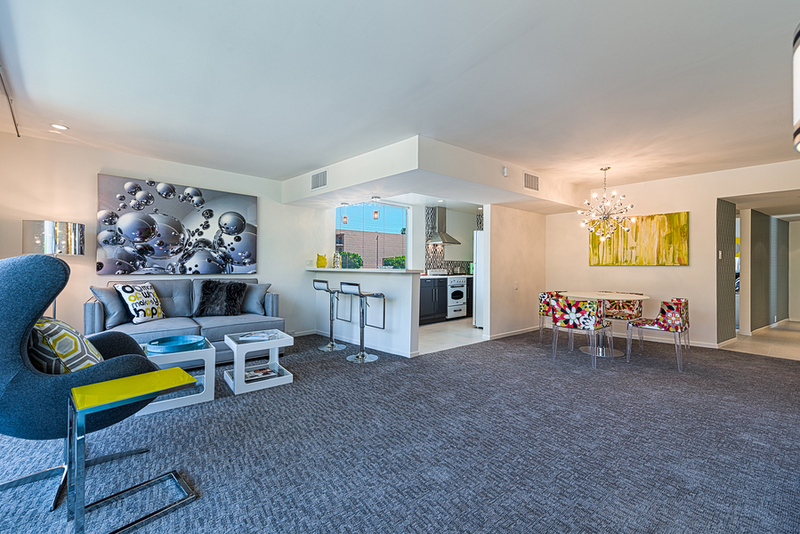 There is a pull out couch for two additional guests and cable TV as well. 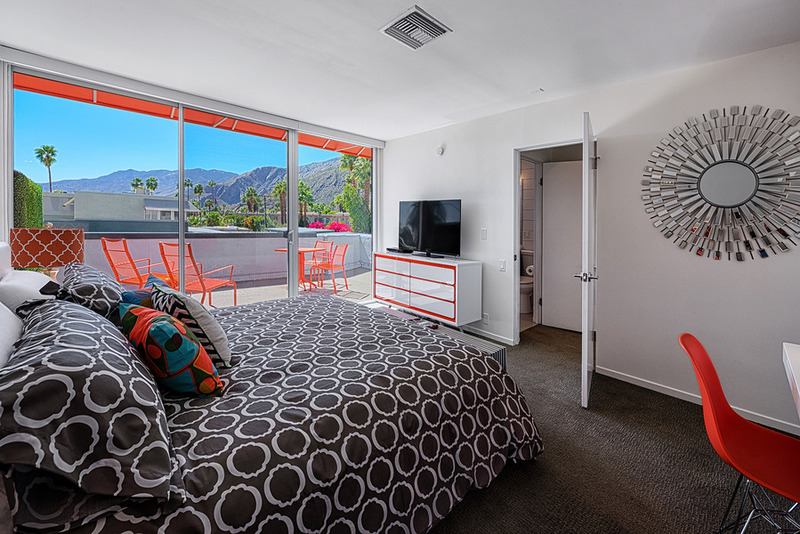 The bedroom is equipped with a King bed, comfortable linens, and access to an over-sized balcony overlooking Palm Canyon Dr.
1BR, Balcony #216: This apartment is bright and cozy, and provides views of the Mountains from an over-sized, private balcony off the bedroom, within steps from the central pool, Jacuzzi and grill. 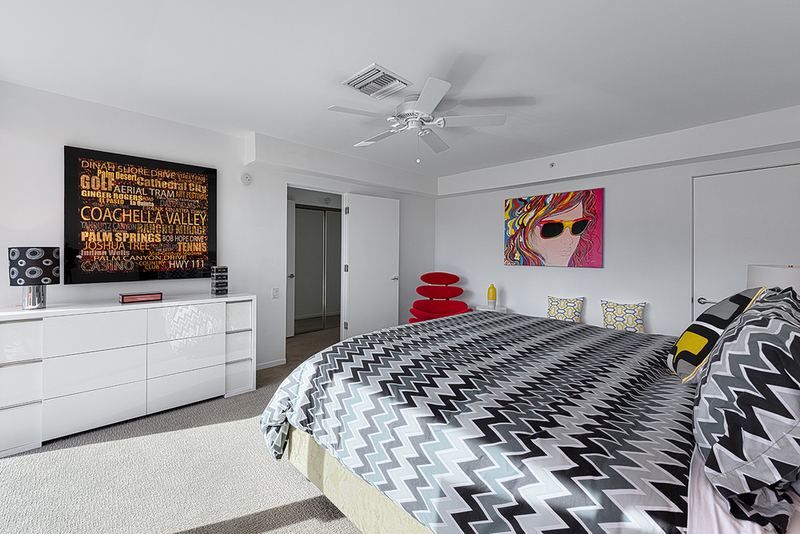 The bedroom is tucked away on the North end of the building and equipped with a King bed, comfortable linens, a hidden working space and a BluRay player for watching DVDs on the flat screen TV. 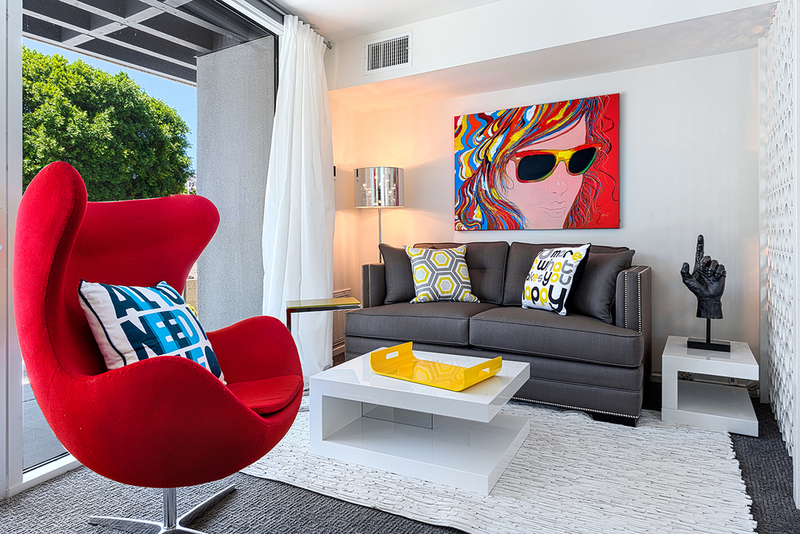 The living room has cable TV and offers a colorful setting with a plush sofa and views of the top floor courtyard.